Top: Dominique Ware and Rob Sterling. 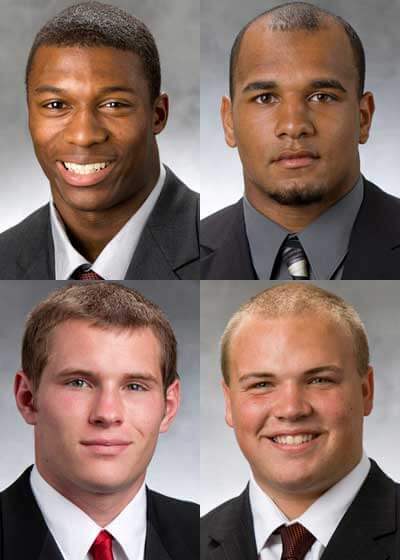 Four players from Northern Illinois University’s 12-win, MAC West champion football team were named to the 2013 Academic All Mid-American Conference squad Friday with another four Huskies garnering honorable mention recognition. The team is selected annually by the league’s faculty athletics representatives. NIU senior safety Dominique Ware (Bolingbrook, Ill./Plainfield North HS), junior fullbacks Rob Sterling (Lansing, Ill./T.F. South HS) and Ricky Connors (Powder Springs, Ga./Harrison HS) and sophomore receiver Jacob Brinlee (Lake Zurich, Ill./Lake Zurich HS) were four of the 41 players named to this year’s Academic All-MAC team. Sterling earned the honor for the second consecutive season while the other three were first-time selections. Only one team in the league had more players named to the Academic All-MAC squad. “I’m proud of these four as well as the four players who received honorable mention recognition,” said NIU head coach Rod Carey. “The hard work on the field and in the classroom is paying dividends. They represent our university and our football team really well and I couldn’t be happier for them to earn this individual accomplishment. NIU’s four honorees all achieved a grade point average of 3.59 or higher, topped by Brinlee’s 3.80 mark. The mechanical engineering major caught six passes for 76 yards as a receiver and made six tackles while playing on multiple NIU special teams in 2013. At the team’s annual banquet, he was a co-winner of the Jawan Jackson Award, presented to the Huskies’ top walk-on contributor. Ware rides the shoulders of his teammates during a Poinsettia Bowl practice. Ware made a career-high 41 tackles from his position as the Huskies’ starting nickel back with two interceptions and four pass break-ups. Like Brinlee, a special teams stalwart for the 12-2 squad, he shared the NIU Special Teams MVP Award and his effort was characterized by his recovery of an attempted onside kick in the Huskies’ win over Ball State. Ware, who his pursuing his MBA from NIU’s College of Business and carries a 3.59 GPA, made at least one tackle in every game. The Huskies’ starting fullback, Sterling caught four passes for 25 yards and played a large role in helping to block for NIU’s record-setting rushing offense totals. In addition to playing in all 14 games at fullback, the junior accountancy major with a 3.60 GPA was a member of the kickoff return team and was named the winner of the team’s Scholastic Award at the 2013 team banquet. The Huskie offense set nine school records in 2013 and broke three Mid-American Conference offensive marks. Connors also contributed to the record-setting offense that saw a pair of Huskies backs go over the 1,000-yard mark in rushing for the first time in school history. The junior, who earned his bachelor’s degree in three-and-a-half years as a double major in sociology and international politics with a 3.73 GPA, caught an 11-yard touchdown pass versus Eastern Michigan to highlight his season. The Academic All-MAC honor is for a student-athlete who has excelled in athletics and academics. To qualify, a student-athlete must have at least a 3.20 cumulative GPA and have participated in at least 50 percent of the contests for that particular sport. First-year students and junior college transfers in their first year of residence are not eligible. In addition to the four Huskie voted to the team, offensive linemen Matt Krempel (Columbus, Ind./Columbus North HS) and Jared Volk (Hartland, Wis./Arrowhead HS), tight end Luke Eakes (St. Marys, Kans./St. Marys HS) and defensive end Jason Meehan (St. Louis, Mo./Webster Groves HS) were named honorable mention Academic All-MAC.